An early product of the Cîteaux scriptorium which was completed during Stephen Hardings abbacy is an elaborately decorated copy of Gregory the Greats Moralia in Job. This was a lengthy work of thirty-five books, divided into six volumes. The Cîteaux copy was originally in one volume but survives now at Dijon in four (MSS 169, 169, 170, 173). It was completed on Christmas Eve 1111 and includes depictions of the community at work  felling trees, splitting logs and reaping corn, as well as more fanciful images of jongleurs, beasts and grotesques. The image to the right is from Gregorys prefatory letter addressed to Bishop Leander of Seville. 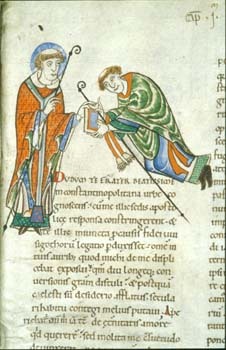 This shows St Gregory (left) nimbed and vested as pope, handing a copy of his Moralia to Bishop Leander of Seville, to whom it is addressed.